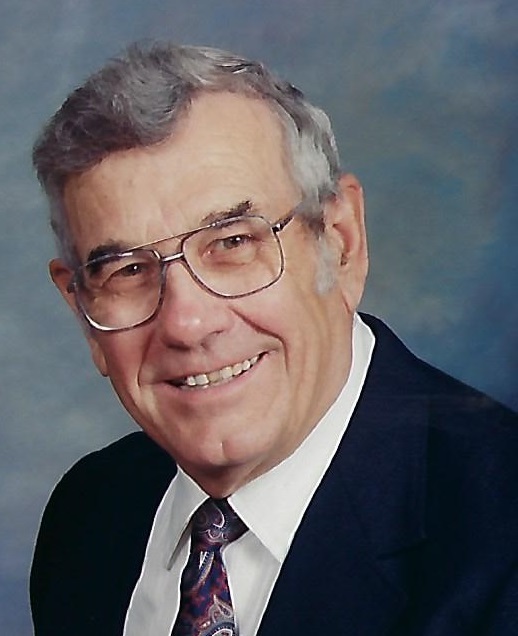 Mass of Christian Burial will be 10:30 AM Friday, March 22, 2019 at the Church of All Saints, St. Mary’s in Holdingford for John Christopher Ebnet of Holdingford who passed away Saturday, March 16 at the St. Cloud VA Health Care System. There will be a visitation on Thursday, March 21 from 4:00 PM to 8:00 PM at Church of All Saints, St. Mary’s and again on Friday, March 22 from 9:30 AM until the time of the service at the church. Parish Prayers will be at 4:00 PM on Thursday at the Church. Arrangements are with Miller-Carlin Funeral Home, Holdingford. John was born December 21, 1926 in Holding Township, Minnesota to Frank Ebnet and Elizabeth (Vos) Ebnet. He grew up on the family farm, the second youngest of 13 children. He attended Holdingford High School and served in the United States Army in the Korean Conflict, attaining the rank of Sergeant First Class. Prior to departing for Korea he married the love of his life, Helen Iris Miller on March 28, 1951 and enjoyed 56 years of married life until her passing in September 2007. John and Helen owned Holdingford Our Own Hardware from 1957 to 1997 and provided quality hardware, plumbing, propane, appliances and customer service to people throughout Stearns County. John enjoyed playing baseball for the Holdingford Town Team for many years including the 1953 team that participated in the Minnesota Amateur Baseball Tournament. He took special pride in being a member of the 1947 Ebnet nine brother baseball team. He enjoyed numerous rounds of golf with his friends at the Albany Golf Club. John served as Mayor of Holdingford from 1971-76 and was an active member of many organizations including the Holdingford Volunteer Fire Department, American Legion, St. Joseph’s Society, Knights of Columbus, Commercial Club, and St. Mary’s Catholic Church. He is survived by sons, Paul and his wife Jean Januschka Ebnet of St. Cloud, Anthony and his wife Melissa Ebnet of Albany; grandchildren, Peter (Leili Fatehi) of Minneapolis, Angela McGee (Scott) of Big Lake, Kathryn of Plymouth, Nathan (Stephanie) of Minneapolis and Simon of St. Paul; 4 great-grandchildren, Faye, Josie, Evelyn and Elizabeth; his sister Clara Donnelly of St. Cloud and his sister-in-law Jane Miller of Bedford, Virginia. He was greeted in heaven by Helen, their three daughters; Mary, Jacinta and Kelly, his parents, along with his brothers and sisters, Alfred, George, Nicholas, Leo, Ambrose, Roman, Joe, infant Raymond, Elmer, Mary Zeis and Anna Domenico. A special thank you to the staff at the St. Cloud VA Health Care System for the loving and professional care that John received. Memorials in lieu of flowers are preferred to Holdingford Volunteer Fire Department Relief Association. There will be a visitation on Thursday, March 21 from 4:00 PM to 8:00 PM at Church of All Saints, St. Mary’s and again on Friday, March 22 from 9:30 AM until the time of the service at the church. Parish Prayers will be at 4:00 PM on Thursday at the Church. Church of All Saints, St. Mary’s in Holdingford, MN. Mass of Christian Burial will be 10:30 AM Friday, March 22, 2019 at the Church of All Saints, St. Mary’s in Holdingford for John Christopher Ebnet of Holdingford who passed away Saturday, March 16 at the St. Cloud VA Health Care System. Arrangements are with Miller-Carlin Funeral Home, Holdingford.